In 2010, a group of concerned citizens came together and began planning. They felt that as the bicentennial of the War of 1812 approached, there was a need for appropriate commemoration of the Battle of Bladensburg. 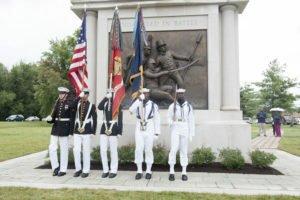 They proposed a monument to serve as a tribute to the soldiers, sailors and marines who fought and died defending their Nation’s Capital on August 24, 1814. 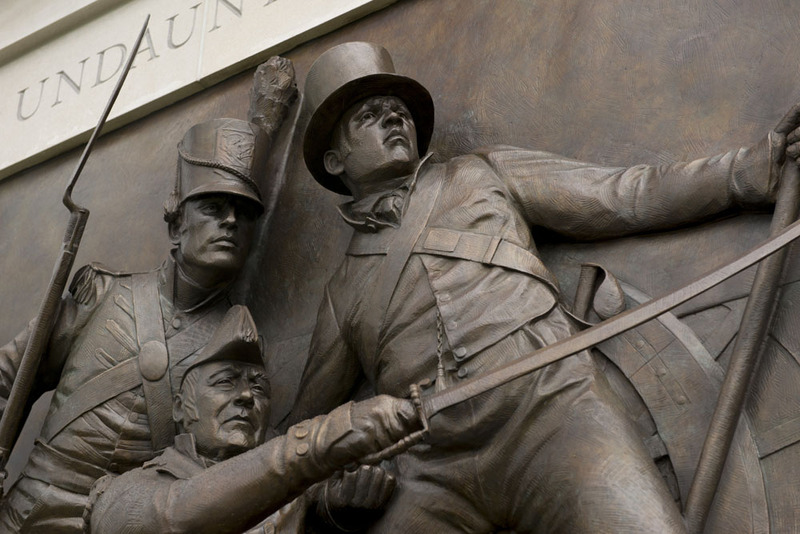 The memorial would present Commodore Joshua Barney, not in a moment of triumph, but shortly after he is wounded. 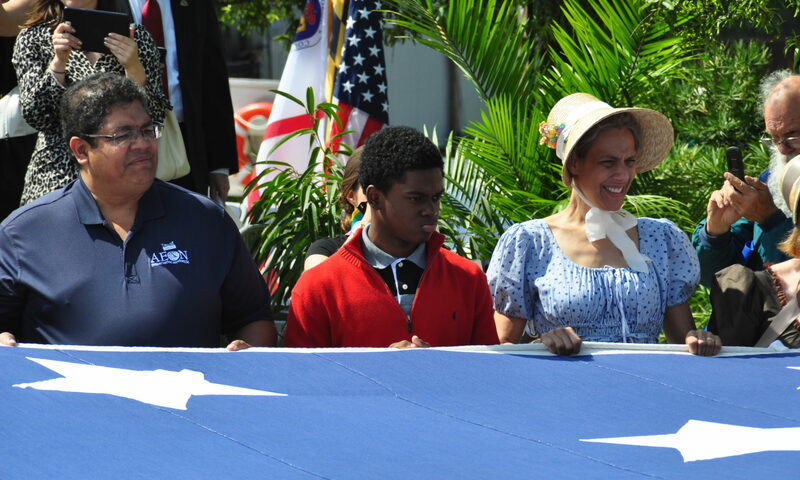 He is being assisted by Charles Ball, a former slave and member of the flotilla who fought alongside Barney at Bladensburg. The other figure represents a member of the Marines. All three figures are looking up, “undaunted” with their weapons at the ready. The figures was sculpted in relief and cast in bronze. 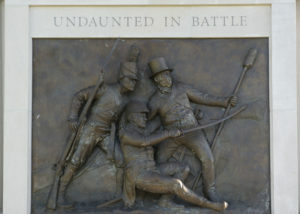 The bronze panel is housed in a limestone base that reads “Undaunted in Battle.” The back surface of the base has a Battle of Bladensburg interpretive marker. Constructed of granite, the marker will provide a focus for tourism in the area, and will contain information about the battle and battlefield, including a narrative summary of the battle with quotations, maps and graphics. The location of the memorial is in the center of the former Bladensburg Balloon Park, a landscaped area owned by M-NCPPC, between the Peace Cross and an existing parking lot next to the George Washington House. The sculptor selected for the proposed memorial was Joanna Blake. Mrs. Blake, who died in 2015, was a resident of Cottage City and a figurative sculptor with a studio in Brentwood, MD. She had worked for Kaskey Studio, Inc., where she has contributed her design and sculpting skills to the creation of a number of large scale public monuments, most notably, the National World War II Memorial in Washington, D.C. The Aman Memorial Trust, who led the development of the monument, is a non-profit, 501 (c)(3) tax exempt organization that supports historic preservation in and about the Town of Bladensburg. The Trust took the lead in organizing a memorial committee that received and disbursed funds for the memorial. 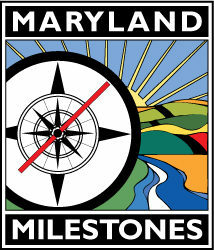 A large deal of the funding was from State of Maryland funds. Amen Trust hopes the sculpture and surrounding landscape creates a space for reflection; a destination for tourists interested in history and a reminder to Maryland residents of the historical events of August 24, 1814.